A huge collection of jewellery that once belonged to the former first lady of the Philippines, Imelda Marcos, is to be sold at auction. It was seized by the government when her husband, Ferdinand Marcos, was overthrown in 1986. The jewellery has been valued at more than $21m (£14.5m). 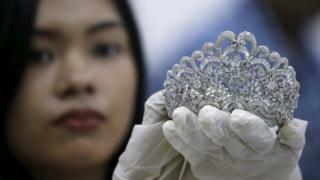 The authorities want to sell the jewels before the end of President Benigno Aquino's term later this year. Mrs Marcos had tried to prevent the sale. Her son Ferdinand Marcos Junior is running for vice-president in elections in May. The family and associates are estimated to have amassed more than $10bn (£6.1bn) in property, jewellery, cash and other assets during their time in power. Mrs Marcos has consistently denied embezzlement. She was found guilty on corruption charges in the mid-1990s and sentenced to a minimum of 12 years in prison, but the conviction was overturned on appeal. In 2014 some artworks in her possession were taken away by the authorities, who said she had acquired them with state funds. After the coup that overthrew Mr Marcos, hundreds of millions of pounds were recovered from his bank account in Switzerland and later awarded to the government.